The NSW Nationals have been returned to Government, with swings toward the Party in many electorates. Unfortunately, three seats were lost following a hard fought campaign. 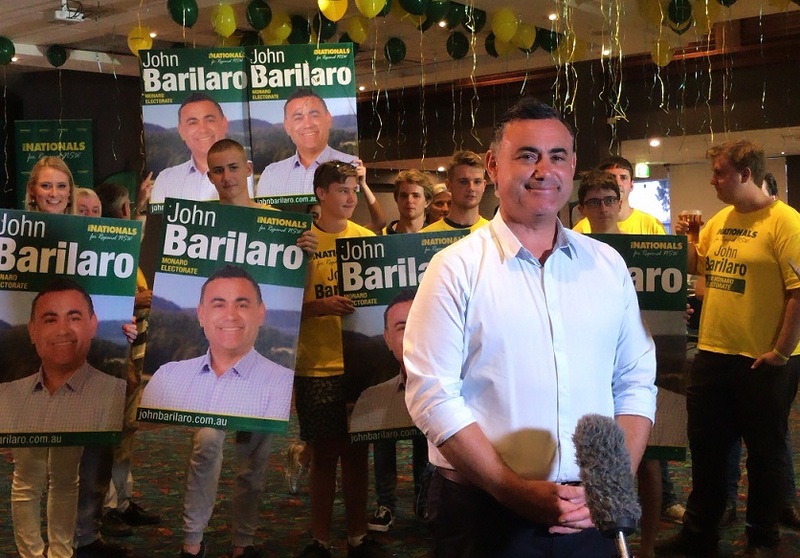 Deputy Premier and NSW Nationals Leader John Barilaro recorded a massive swing towards him in his electorate of Monaro, where he won every booth and made this once-marginal seat safe. Successful candidates Dugald Saunders and Gurmesh Singh replaced retiring MPs in Dubbo and Coffs Harbour respectively, and the hard-working Steph Cooke returned Cootamundra to ‘safe seat’ territory. Unfortunately, The Nationals were unsuccessful in Barwon and Murray, where the Shooters exploited the drought and teamed up with Labor and protest group ‘Anyone But Nats’ to win power. But it is unlikely those new Shooters MPs will have any influence for the next four years, with their constituents now left without an effective voice in Parliament. In the State’s north Labor career politician Janelle Saffin managed to squeak across the line in Lismore despite falling far short of The Nationals’ Austin Curtin on primary votes. The Nationals now have another four years to deliver for the people of rural and regional NSW. Special mentions must go to a number of our hardworking candidates, who all campaigned incredibly well. In Orange, Kate Hazelton unified the Party and presented a serious challenge to the incumbent Shooters MP; in Wagga Wagga, Mackenna Powell took on a popular Independent who had only recently been elected; Andrew Schier faced a barrage from multiple opponents in Barwon and continued to fight hard; Josh Angus took paint off Labor in its heartland of Cessnock near Newcastle, campaigning hard on protecting coal jobs in the face of a Labor-Greens shutdown of the industry; Ben Franklin very nearly won Ballina back from the Greens but was up against Labor-Greens preference deals; and Austin Curtin ran an incredibly strong campaign in Lismore whilst up against another Labor-Greens preference deal designed to get Labor over the line.